Advertising that is two times more effective! Digital Advertising, Display Ads, Online Advertising. What do these things have to do with these images of drinks on a railing? Well, a lot, actually! I have this little thing I like to do. 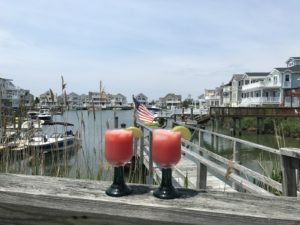 When I get down to our Family’s Shore House and it’s determined to be time for a cocktail, I like to take a picture of it and post it to FaceBook. It’s quirky, I know. BUT it has some traction! After doing this pretty consistently for the past three or four years, folks have come to expect it from me and have – on many occasions – taken pictures of their own drinks on their own railings and have tagged me on their images. So what has happened (Besides sclerosis of the liver) is an accidental viral display campaign. People are responding positively to my images. They are sharing them. They are clicking back to my page, not unlike a backlink. They are asking me for more images. I have created a brand. Albeit a brand of fun in the Sun and libations, it is a solid brand. Digital Marketing – Drinks on a Railing! So what have we learned here? We have learned that with a strong image, a consistent message and the proper platform, you can develop a strong brand out of almost anything! Let’s think about the possibilities. I could take this image and put it into a post every week. I already know folks respond to these images. Then I can share that image AND the post on FaceBook, Instagram, Google+, Twitter, LinkedIn and any other form of social media I see fit. I can share it in groups that I manage or belong to and I can post it to open groups with a common theme. Pretty soon I will have tons of followers enjoying images of my drinks on a railing. Now how can I monetize this? I can make a photo montage of images of drinks on a railing, set some fun music to it and post it to YouTube. I can share the link on all my platforms and put that into a post with keywords like “Cocktails”, “Vacation Homes”, “Avalon” and maybe – as in the case above “Orange Vodka Drink Recipes”. Then I will make sure those keywords are reinforced in my blog content and I am ready to go. Next would be to monetize the video and select ad types, which make sense to play before my video. I could make a web page focused entirely on drink recipes titled “Drinks on a Railing”! In the end, the message is clear. If you want to reap the benefits of a successful display advertising campaign, you need a strong image. You need consistency. You need frequency. You need a clear message and you need the proper platform. Please don’t hesitate to call me if I can help you with YOUR campaign!